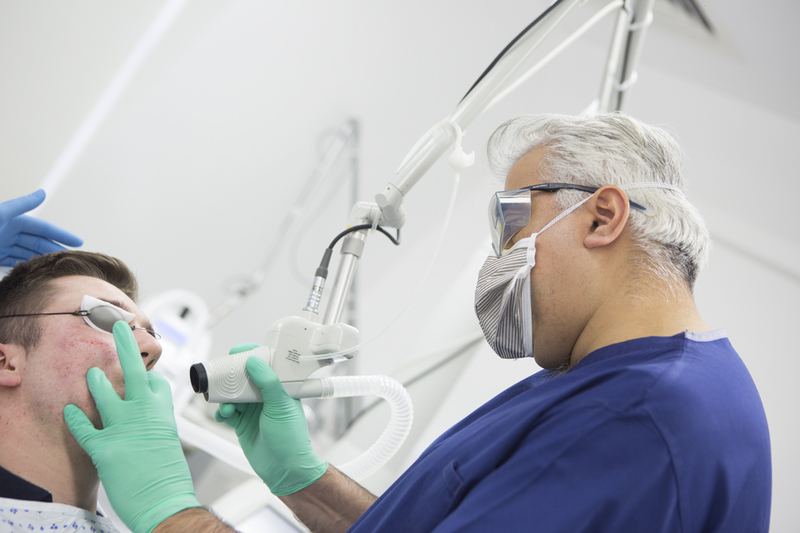 Dr Firas Al-Niaimi has a wealth of knowledge and experience in laser treatments. Laser resurfacing is a type of skin resurfacing that uses a specially crafted beam of thermal energy or Co2 to vaporize skin cells which are damaged at the surface level of the skin. This allows your skin to reform to eliminate skin blemishes, fine lines and facial wrinkles. Laser resurfacing can be used to treat small sections of the face, or as a full face treatment. This means that your dermatologist can specify the laser skin resurfacing to specific problem areas, such as the cheeks or upper lip and chin. Dr Al-Niaimi will discuss the most effective type of laser peel for you during your consultation. One of the two types of laser resurfacing is CO2 laser resurfacing. This makes use of short pulsed light energy, otherwise known as ultraphase to zap damaged skin and ignite a healing process. This laser is typically used to treat deeper lying wrinkles and lines as opposed to the erbium laser. The treatment can be used on many areas of the body although it is typically used on the face with the sole purpose of removing lines, wrinkles and other signs of ageing. Despite how effective CO2 laser resurfacing can be, it does require a more extensive recovery period as the treatment effects the skin far deeper and less superficial than other treatments such as erbium laser resurfacing. Erbium resurfacing is an option for clients who would prefer to tackle more superficial and less developed wrinkles and lines. Erbium laser resurfacing is perfect for somebody who is looking for an effective treatment with far less downtime than is associated with other treatments. Erbium laser resurfacing is an FDA-approved tried and tested method for improving the condition and look of your skin. Following treatment, your confidence will be improved as well as your look and well-being. Laser skin resurfacing is a facial treatment which delivers short, concentrated laser beams to irregular skin, removing the blemished skin layer by layer. Laser skin resurfacing is a skin rejuvenation treatment which is designed to minimise the appearance of fine lines and facial wrinkles, as well as skin blemishes such as acne scars. The use of high energy lasers allows your skin to naturally regenerate and reform. This technique can focus on specific areas, such as: “crows feet”, fine lines around the mouth or along the forehead. Laser treatment for skin works by focusing a beam of Co2 or thermal energy upon blemishes on your skin and removing the layers of your skin. By vaporising the upper layers of skin, the laser will allow your skin to naturally repair and reform. This will encourage new, healthy skin to grow and minimise wrinkles and irregular skin, leaving smooth, healthy skin underneath. This also means that specific ‘problem areas’ of the face can be focused on, such as cheeks or lips. What are the types of laser skin resurfacing? There are two different types of laser skin rejuvenation techniques including Co2 lasering and Erbium laser resurfacing. Co2Co2 uses very short, pulsed light energy; this removes thin layers of skin with minimal heat damage. Erbium laser resurfacing is designed to remove surface level and moderately deep lines and wrinkles. This laser treatment causes fewer side effects, such as swelling, bruising and redness, so your recovery time is likely to be faster than Co2 skin rejuvenation treatment. What can I expect from laser skin resurfacing? Prior to your treatment, the targeted area will be numbed using local anaesthetic to minimise discomfort. It is likely that if the whole face is being treated, your Dr Al-Niaimi will sedate you, or you may require a general aesthetic. Following the procedure the area will be bandaged. Following treatment (around 2 hours after) you will need to clean the treated area four to five times a day with an aftercare cream to prevent scabs from forming. This will mean the skin retains moisture, prevents scabbing and promotes healing. In general, the area should heal within 10 to 21 days. What are the complications of laser skin resurfacing? It is normal after a laser skin procedure to have swelling around the area that has been treated. This can be reduced by applying ice immediately after the procedure. To manage swelling around your eyes, Dr Firas Al-Niaimi may prescribe steroids. 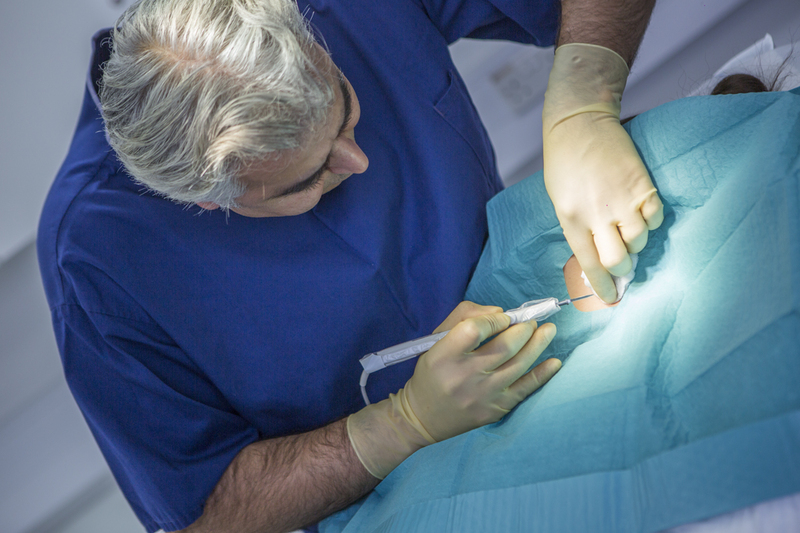 Complications can include burns or other injuries from the laser’s heat which may involve scarring. The laser beam may also cause changes in the skin’s pigmentation, creating darker or lighter patches. Laser facial resurfacing may also cause a bacterial infection which may need to be managed by antibiotics. With an experienced dermatologist such as Dr Al-Niaimi, these risks are greatly minimised. 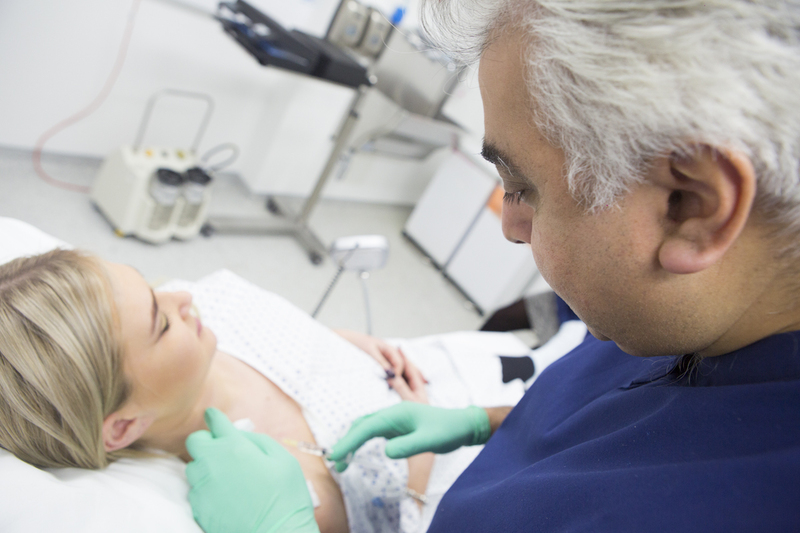 What is the cost of laser skin resurfacing? Depending on how big the targeted area for your treatment is, laser skin rejuvenation costs will vary. All costs will be discussed prior to your consultation in Harley Street, London, and confirmed before the end of your initial consultation.